No offense to cats, but those words above kept me sane as I made two little gifts for my brother-in-law's cat, Sweets, on a very tight deadline (because I'd forgotten I'd said I'd do it and they had to get to California, stat). Classy backdrop, there. 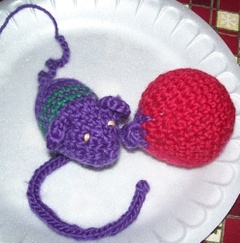 They are stuffed with a combination of polyfill and catnip. I really know nothing about cats, so I hope these are all right. All I can say is, thank goodness for crochet. And express mail service. 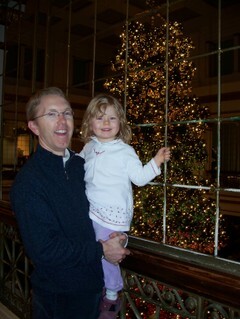 Clark and Ellie at the Walnut Room at the department store formerly known as Marshall Field's. This is on the eighth floor -- the base of the tree is on the seventh floor! And I should give Macy's its due respect -- these two floors are like shrines to Marshall Field's. I hadn't been in there since the takeover and was impressed. I'd show you our tree but can't get a decent photo for the life of me! 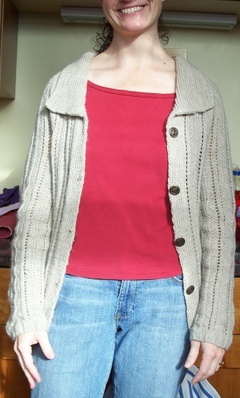 I still haven't put the Maisie cardigan together, though the Christmas deadline should get my fingers flyin'. But I was so charged up about finishing Ariann, and so inspired by Sue's wonderful sweaters for little ones, that I immediately started a sweater from Miss Bea's Rainy Day for Ellie. I think it's the Cookie Sweater -- please excuse my not double-checking that. This is old-school Cotton Ease, and the stitches should tighten up in the wash. I recall the same wonkiness the last time I worked with All Seasons Cotton. But hey, I'm getting gauge. 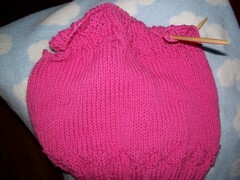 I'm doing it in the round on a new circular needle that is skewing all over the place. But this may be finished for New Year's, which would be nice. Hope final preparations for Christmas are going along well in all households, and/or that a nice, relaxing couple of days are in the offing for all and sundry! Oh, what fun it is to KIP and trade ornaments, hooray-ay! Thank you for the compliments on Ariann! I am wearing it all over the place and loving it. And thanks also to all who attended KIP the other night and made it such a nice evening! Many happy returns to Corinne, of course, who celebrated a milestone birthday and was the most gracious birthday girl! We missed Rachel but look forward to giving her belated birthday wishes in person as well. And the ornament exchange was lots of fun. Watch the KIP blog for news of more fun in '08. Seasonal b-day parties, for starters! Not great pictures (the bar across the belly is a shadow from the window frame), but I hope you can tell this is the lovely Ariann, which I love to bits and will wear to threads. Note 1: I'm not usually a pre-wear blocker, but Bonne Marie is right about the positive changes blocking will bring to the sweater. Note 2: I may wear this every day till June. Note 3: I'm not sure about these buttons, though they're growing on me. We'll see. Of course, in order to change the buttons I would have to remove the sweater, which is a strike against changing the buttons. Perhaps in June. So I won't be able to show you a picture of my finished...Ariann! I became obsessed with finishing it last week. I think the obsession was fed by the time-consuming mistakes I made, which made me want to press on all the more. 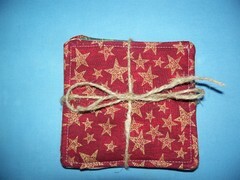 As you will see, it's got a slightly different finished look than the pattern. At least, I hope you'll consider it only slightly different! But I think I made the yoke longer than it should be. Fortunately for me, I like it this way, though of course I would have preferred to do it correctly. 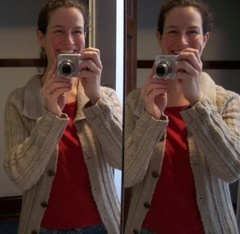 It's a genius pattern, seriously, and I know I am going to love wearing this sweater for years and years. They're cute, aren't they? The solid one was Clark's, so we brought it home. 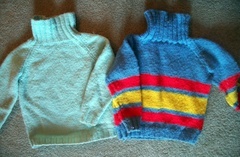 I think if I put some elbow patches on it, Ellie will be able to wear it in a couple of years. Wouldn't that be something -- wearing a sweater knit by your great-grandma? There's an advantage of acrylics over natural fibers; I'm 99-percent sure these received no special handling either while they were being worn or while they were in storage. 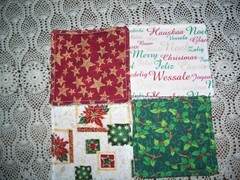 I don't have a long list of holiday gifts I intend to make. Come to think of it, I don't have a list of gifts I intend to make at all. I have bought a number of handmade gifts thus far, which has been a lot of fun, and I will probably make some things as the month goes on. 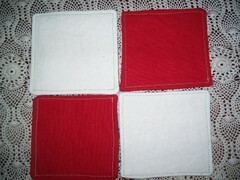 They will join these little coasters that I made Saturday afternoon as a host gift for a party we were going to...Saturday night, naturally. I more or less followed the pattern in Amy Karol's Bend the Rules Sewing, which is a fun book. It was nice not to have to pop in somewhere for a gift on our way to the party. Thanks for leaving comments about our Ellie's new toy! His given name is Jumper Fox, and I think he'll keep that around here as well. Ellie may have other ideas, but we'll have to wait for Christmas to find out. If you ever need to know, one skein of Malabrigo will give you four pairs of infant socks with a remainder of about six inches. 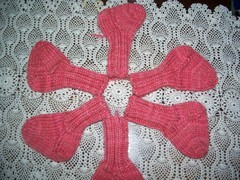 Here's a clock of socks; the fourth pair wasn't yet finished. Too bad I had to tuck this one in with its mates -- it might have given the doughty USPS people a smile at this busy time of year. The post office was already mobbed on Dec. 1...Thank you, Post Office, for those automated kiosk thingies!